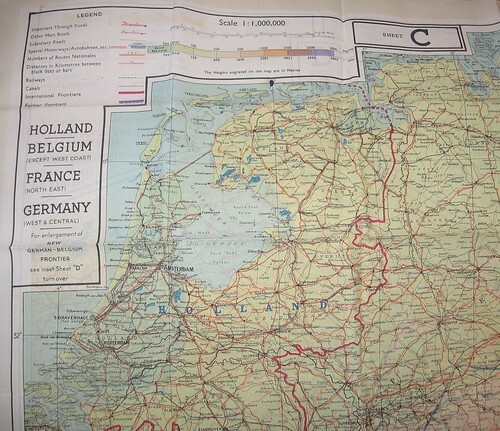 Yesterday, I received in the mail my grandfather's cloth escape maps of France, Holland, Belgium, Luxembourg, and Germany. He flew a Piper Cub for the US Army, mainly shuttling brass between England and France. Never used, the maps went from a pocket in his jacket to an envelope in a foot locker; they're in great condition. 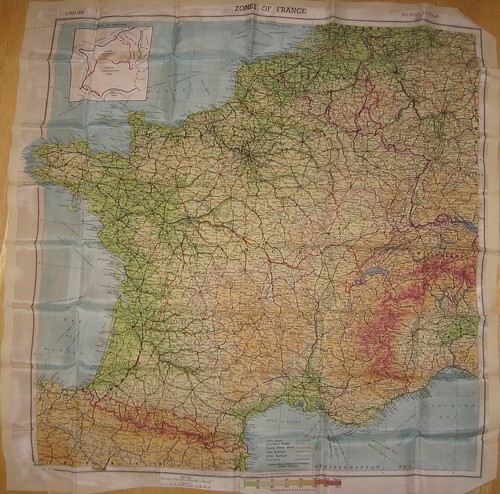 Above is a 1:2,000,000 scale map entitled "Zones of France", second edition, and dated "MAR 44". Silk or rayon. I know little about the origins of this one. It features 4 hand-drawn "placemarks" South of Cherbourg. Positions of forces? Airfields supplied with beer? I've quickly found much more information about the 1:1,000,000 scale 43 Series map above. It is most likely rayon, as silk was then in short supply. Map C on one side, D on the reverse. I'll be having these framed soon. That's a very interesting set of maps indeed ! I think hand-drawn placemarks are German troops positions, as Canisy, south of Saint-Lô was an important part of Atlantic Wall. Saint-Jean de Daye has been an important victory of allied forces, on the 7th of july 1944. Avranches has been a major battle too, but later, around the 31st. Thanks for sharing this ! Thanks for the context, Guillaume. Speaking of survival, take a look at the DoD Evasion Chart (EVC) "produced on a strong, moisture-resistant polyester material (spin-bonded olefin)"--purportedly an important part of Air Force Captain Scott O'Grady's survival after being shot down in Bosnia: http://www.nga.mil/portal/site/nga01/index.jsp?epi-content=GENERIC&itemID=17386591e1b3af00VgnVCMServer23727a95RCRD&beanID=1629630080&viewID=Article Note also the background note concerning the EVC: "The history of the [EVC] goes back to charts printed on rayon during the 1940s, and to cloth 'blood chits' printed in various languages that identified American airmen and offered rewards for safe passage during World War II and the Korean and Vietnam conflicts." Anybody recognize, or better yet: have a reference for, the symbology in the "Zones of France" detail image? Guillaume, I'm thinking specifically about the placemarks. I think I've found an explanation at http://www.globalsecurity.org/military/library/policy/army/fm/101-5-1/f545-c4a.htm. Unless somebody used this map to track the location of a particular friendly unit in the campaign, you're right about it being pre-landing German positions. 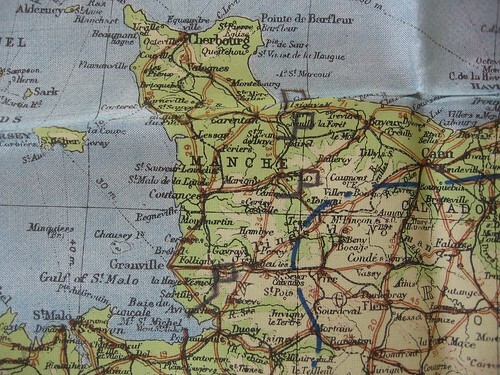 Here's a map showing German units arrayed diagonally across the peninsula on 6 June 1944: mp1.jpg. Indeed, but it highly depends of the precise date on which the placemarks have been drawn. Things moved quickly during that summer, and what was a German position soon became an allied one ! I confirm all the infos given by Guillaume, and I also agree that it is interesting information in a very good quality shape !!! Keep this maps with you, they may become really researched in a couple of years !